Are you brave enough? Then this game is for you. Here you are going to shoot and kill every foe, who is trying to attack you. Just use S to change your characters you wanna to control and space to shoot. Watch out! There are so many enemies here! 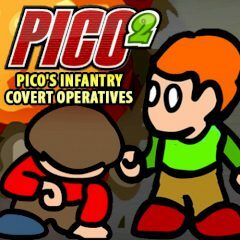 This is the best sequel to the first Pico's Infantry you have ever seen. That is why, here and now you will be ranked according to your number of wins and also you get to choose your terrain, number of enemies and other options you will surely enjoy. So, if you are ready for such an exciting challenging game, then the only one advice to you is just to do everything right and help your little heroes. Use S to choose the character and space to shoot. Kill all the enemies and you will like it! Enjoy the game and have fun.